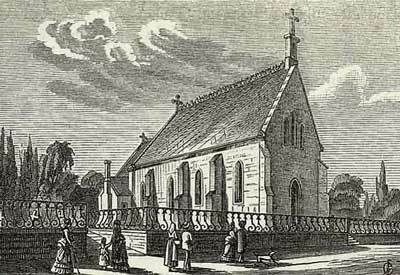 The first Anglican priest was licensed to minister to the British colony at Montreux in 1860. There being no English Church then, services were held regularly for more than fifteen years in the Swiss Protestant Church of Montreux. But before long a move was made to build a church, and in 1875 the original church of Saint John the Evangelist was begun (it was completed in 1878). The British colony soon became so large that the church had to be extended three times. In 1889, a ‘Church Institute’ was built beside the church, soon to house the “English Library”. That organization still exists in Montreux and celebrated its centenary in 1989. In 1954, the Library was moved to allow the Institute to be converted into a residence for the Chaplain of St. John’s. St. John the Evangelist Montreux, Pamphlet.